This curriculum and course listing is for students starting the program in fall 2018. Students who enrolled in the program prior to fall 2018 are required to follow the fall 2017–spring 2018 curriculum. * Students registered in the online option may participate only in online courses. Students registered in an on-campus option may participate in on-campus and online courses. ** International students are responsible for ensuring they have read and understand the University’s student visa application eligibility and requirements. Please note that it is not permissible to enroll while in B-1/B-2 status. In addition, if studying on a student visa, you must enroll full-time (12 credits per term) and study on campus. Students on an F1 visa are permitted to complete no more than one online class each semester. *** Spring intake is available only for the program’s New York City options. The program may be completed in several different ways. Part-time (San Francisco) Students may complete the program through a combination of online coursework and four multi-day blocks of intensive study. Part-time (Online) This option does not qualify for a student visa. The Management Core will help you develop an enterprise-wide perspective on data and the knowledge, skills, and abilities needed to inspire, create, and foster an analytical culture within an organization. The Technical Core will introduce you to the methods and range of tools and systems that organizations use to conceptualize, collect, manage, and analyze data to produce information to make it actionable across their enterprise. For your elective study, you will align the foundational skills you've developed in the two core areas with three courses you choose that are pertinent to your academic and professional goals. Elective courses in a wide range of subjects, including business, finance, marketing, information visualization, collaboration, communication, and negotiation, let you obtain in-depth knowledge in a particular industry or functional area within an organization. Completing your capstone project, you will apply what you have learned in the two core components to a real-world analytics project sponsored by one of several leading organizations. Beginning in Summer 2019, the APAN 5900 Capstone Project: Solving Real-World Problems with Analytics will be taught in fully online format only. All students will complete the course virtually. Students on an F-1/J-1 visa must enroll in on-campus coursework; therefore, students on an F-1/J-1 visa may not enroll in the capstone as their only course and remain in the United States. International students who wish to take fewer than 12 credits in their final term should plan their courses with their advisor. Students who enrolled in the program prior to fall 2018 are required to follow the fall 2017–spring 2018 curriculum. 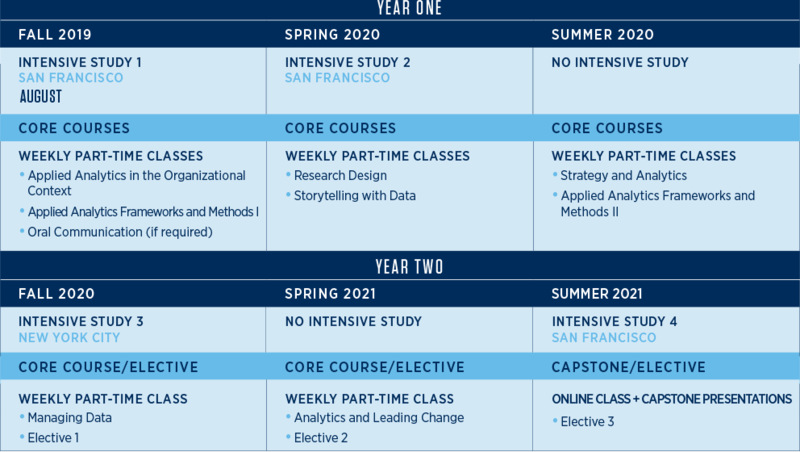 Students will have the option to take the program on a part-time basis that combines core coursework in two formats: multi-day blocks of intensive study (three in San Francisco and one in New York City) and synchronous online courses offered during weeknights and/or weekends. The intensive study will feature coursework, guest lectures, networking, group projects, and extracurricular activities. During intensive study in New York City, students will interact with the Applied Analytics students based there. The final semester will be presented in a two-part format; early in the semester, students will start developing their capstone projects during intensive study, returning at the end of the semester to deliver their capstones during a final intensive study. APAN PS5100. Applied Analytics in the Organizational Context. 3 pts. APAN PS5800. Storytelling with Data. 3 pts. APAN PS5600. Strategy and Analytics. 3 pts. APAN PS5700. Analytics and Leading Change. 3 pts. APAN PS5300. Research Design. 3 pts. APAN PS5200. Applied Analytics Frameworks and Methods I. 3 pts. APAN PS5205. Applied Analytics Frameworks and Methods II. 3 pts. APAN PS5400. Managing Data. 3 pts. APAN PS5900. Capstone Project: Solving Real World Problems with Analytics. 3 pts. The following approved electives are available both face-to-face and online. APAN PS5335. Machine Learning: Concepts & Applications. 3 pts. APAN PS5210. Python for Data Analysis. 3 pts. APAN PS5310. SQL and Relational Databases. 3 pts. APAN PS5410. Managing Data Assets and Liabilities. 3 pts. TMGT PS5124. Knowledge Management. 3 pts. The following approved electives are currently offered only in online format. APAN PS5160. Data Modeling. 3 pts. IKNS PS5336. Collaboration at Scale. 3 pts. IKNS PS5338. Digital Product Innovation. 3 pts. APAN PS5550/IKNS PS5550. Research Based Product Design and UX. 3 pts. The following approved electives are currently offered only in face-to-face format. APAN PS5180. Internet of Things (IOT) – Use Cases, Architecture and Analytics. 3 pts. APAN PS5337. UX and Design for Analytical Apps. 3 pts. APAN PS5420. Anomaly Detection. 3 pts. APAN PS5470. Introduction to Blockchain, Crypto-currencies & Analytics. 3 pts. BUSI PS4007. Programming in JAVA. 3 pts. BUSI PS6014. Underwriting. 3 pts. LAW PS5010. Introduction to Business Law. 3 pts. LAW PS5020. Introduction to Intellectual Property Law. 3 pts. NECR PS5105. Introduction to Negotiation. 3 pts. NECR PS5124. Intrapersonal Dynamics and Conflict. 3 pts. SUMA PS5169. Sustainability Metrics. 3 pts. SUMA PS5193. Statistics for Sustainability Management. 3 pts. The following approved electives in actuarial science are available online for Applied Analytics master’s students. ACTU PS5619. Pensions. 3 pts. ACTU PS5030. Introduction to Life Insurance. 3 pts. ACTU PS5630. Property/Casualty. 3 pts. ACTU PS5621. Investment & ALM for Actuaries. 3pts. Applied analytics is about the strategic use of data and analytics to inform decisions within an operating environment. The use of analytics is rapidly becoming ubiquitous across all organizational functions. This course helps students understand how data and analytics are used across different functions to inform decisions that impact the organization. As such, it is the introductory course to the professional practice of applied analytics and the first course in the leadership sequence. The course focuses on data and analytics within operational functions of different kinds of organizations across a range of industry sectors, and the overall ecosystem within which they operate. Students will also learn about the broader context—economic, technological, social, and demographic, and how these trends are influencing the use of analytics. Students learn how data and analytics are used to understand how an organization is currently performing, and how data and analytics can be used to inform future actions to optimize the performance of an organization. The goal is to introduce students to the professional practice of applied analytics, focusing on how analytics can inform a wide range of operational decisions within an organization. This course focuses on the step after insights have been generated from data, and asks the question: what needs to change in an organization's strategy to benefit from those insights? It is the second in the sequence of analytics leadership core courses. Having developed an understanding of organizational strategy, special emphasis is then placed on the interplay between analytics and strategic considerations in an organization. The course teaches students about the practical application of analytics to strategic thinking on two levels: that of the organization (how are analytics used to drive the organization’s strategy?) and the analytics team (how is the organization’s strategy driving the activity of the analytics team?). The successful implementation of analytics depends not only on developing good insights and good strategy, but is also an exercise in managing the necessary changes. The inspiring stories about the importance of analytics today are about how what was learned through analytics was actually implemented to enable an organization to improve its operations, effectiveness, or return on investment. This course--the third in the sequence of analytics leadership core courses—is about changing the behavior and the culture of organizations, with particular emphasis on how to successfully introduce the methods and results of analytics. Students explore the motivations, obstacles and interventions of change, and learn to build alliances, facilitate difficult meetings and develop a transformation plan. The course focuses on practical skills as they are being developed at organizations with pioneering analytics capabilities today. Students will review some of the most important academic research and business publications on change management and the implementation of analytics. However, the course is also intended to enhance practical skills, so students will engage in some real-world practice and role-playing with classmates. As they master each module, students will incrementally develop a plan to introduce analytics into the organization where you currently work, or have worked, or hope to work. Data does not have meaning without context and interpretation. Being able to effectively present data analytics in a compelling narrative to a particular audience will differentiate you from others in your field. This course takes students through the lifecycle of an analytical project from a communication perspective. Students develop written, verbal, and visual deliverables for three major audiences: data experts (e.g., head of analytics); consumer and presentation experts (e.g., chief marketing officer); and executive leadership (e.g., chief executive officer). Students get ample practice in strategic interactions in relevant social and professional contexts (e.g., business meetings, team projects, and one-on-one interactions); active listening; strategic storytelling; and creating persuasive professional spoken and written messages, reports, and presentations. Throughout the course, students create and receive feedback on data storytelling while sharpening their ability to communicate complex analytics to technical and nontechnical audiences with clarity, precision, and influence. Organizations need quantitative analysis to solve complex problems and make consequential choices. Research design provides both a coherent framework for collecting relevant evidence and strategies for evaluating that evidence. Knowledge of research design enables organizations to make adaptive and effective use of quantitative analysis in solving problems and making choices. This course serves as a foundational course in the Applied Analytics program. In this course, you will approach problems as methodological thinkers: you will assess whether the organization is asking the right questions, choosing a relevant design, gathering appropriate and meaningful evidence, and using the appropriate statistical analysis to answer those questions. What are the key questions that strategic decision makers need to formulate and answer in order to inform their decisions? What data are available (and unavailable) that might be used to inform the important strategic decisions? What research questions are implied by the needs of strategic decision makers? What data do we need to measure those variables? Are we currently collecting that data? Why or why not? Which analytical methods might be helpful in answering the research question? What might challenge the validity of results and how can research results be communicated in a way that mitigates the risks associated with these challenges? What are the business factors that influence decisions about how research is undertaken? The world is generating data at an ever faster pace, including through business transactions, online searches, social media activities, and a variety of sensors. The ready availability of this unprecedented amount of data creates opportunities to predict outcomes and explain phenomena across a wide range of domains from medicine to business to even space exploration. Supervised learning techniques are being extensively used to make useful predictions and generate insights to tackle problems. These predictive analysis techniques are the focus of this course. As the starting point of the two-part Frameworks and Methods sequence, the course guides students through the data-wrangling process, starting with data exploration and other foundational approaches. The course then covers an array of supervised learning techniques including linear regression, decision trees, and support vector machines. Students also have the opportunity to challenge themselves in applying and combining the techniques they have learned through a predictive analytics competition. Building upon the tools and foundational concepts from Frameworks and Methods I, this course introduces analytic techniques to handle less traditional forms of data, as well as more specialized analytic techniques to help organizations dig more deeply and comprehensively to create value from their data. This course covers unsupervised learning techniques, including clustering, to examine unlabeled data and also covers natural language processing procedures, such as tokenization, to analyze text data. The course further introduces neural networks and other specialized analytics frameworks. Students learn to integrate the techniques that they learned over Parts I and II of the Frameworks and Methods sequence and have the opportunity to apply these tools to real-world problems across topics or industries based on their areas of interest. Great managers of analytic projects are more than mere data users; they are key decision makers and strategic owners in the underlying data processes. This course provides students with foundational context for managing data so that it can be leveraged and used with confidence. Analytic teams work closely with technology partners in managing data. Languages and techniques unique to each team can impede cooperation. To bridge this gap, this course provides a broad overview of data technology concepts including database engines and associated technologies. Sound policies and procedures are also essentials to ensure high quality of data throughout the analytics lifecycle. But the challenges of putting these measures into practice are significant. There are often legacy repositories and business functions to unravel, as well as social and political barriers to overcome. Data ownership and accountability are hard to implement. Operational disruption and conflicting stakeholder requirements pose additional barriers. This course will expose students to foundational data principles, governance processes and organizational prerequisites needed to overcome challenges to ensure data quality. The course serves as the capstone project for the MSAA degree. As an industry-driven project, the capstone requires synthesis of program content applied to real-world challenges to apply the leadership, strategic management, communication and modern analytics core coursework to industry-sponsored analytics projects. Working in teams, with faculty and industry sponsors, students critically assess a company’s real-world data challenges and opportunities, formulate a problem definition, derive insights and develop an integrated data-savvy analytics plan and solution. The project helps students develop and apply the technical, leadership, and communication skills required to identify and implement solutions/approaches and make a great impression on sponsoring client organizations. Data modeling is about understanding the data used within our operational and analytics processes, documenting this knowledge in a precise form called the “data model”, and then validating this knowledge through communications with both business and IT stakeholders. Underlying all successful applications is a robust and precise data model, and similarly, most software development failures are due to a lack of understanding of the data or data requirements. A data model is therefore an essential part of applications development including forward engineering, reverse engineering, and integration efforts. Forward engineering means focusing on business requirements, whereas reverse engineering means modeling existing systems to drive the support, replacement, or customization of applications. Integration projects such as business intelligence efforts, data lakes, and master data initiatives, require a consistent holistic view of concepts such as Customer, Account, and Product. This course helps students to master data modeling and build data models. Students have the opportunity to explore and create conceptual, logical, and physical data models. Students also learn to work with relational, dimensional, and NoSQL data models. After learning the styles and steps in capturing and modeling requirements, students have the opportunity to apply a best practices approach to building and validating data models through the Data Model Scorecard. The Internet of Things (IOT), which connects objects and machines to other objects and machines using the Internet, has been growing rapidly for a few years now. This is beginning to have significant impact on a wide range of industries including autonomous cars, healthcare, and manufacturing. IOT has the potential to drive trillions of dollars in economic value over the coming decade. This course helps students to gain a broad understanding of the IOT ecosystem. The course also guides students in analyzing use cases, developing business cases, and designing high-level IOT architectures for analytics solutions that can drive business value. Basic proficiency in statistical and machine learning methods; e.g., binomial and normal distributions, regression analysis; machine learning. Blockchains have created a new paradigm in secure yet decentralized information management among various entities without requiring trusted intermediaries. Applications to various fields abound including crypt-currencies (e.g., Bitcoin, Ethereum), banking (Ripple), insurance, and logistics. This is an introductory course on blockchains and crypt-currencies. The course introduces the concepts of blockchains using Bitcoin as the main example. It then goes into the details related to underlying fundamentals including cryptographic protocols, hash, digital signatures, chaining of blocks of transactions, decentralization using mining based on proof of work and smart contracts. The course also covers data mining of transactions using machine learning and social network methods. It helps students understand blockchains and its applications as a key peer-to-peer technology and its uses in smart contracts. Python is one of the leading open source programming languages for data analysis. This is an elective course that explores Python programming languages for data science tasks. The students in this course will learn to examine raw data with the purpose of deriving insights and drawing conclusions. Together, we will manipulate large size data sets to extract meaning and generate visualizations. The course assumes no prior programming experience with Python. We will start by learning the fundamentals of data storage, input and output, control structures, functions, sequence and lists, file I/O, and standard library classes. We will then move on to learning Object-Oriented Programming with Python: encapsulation, inheritance and polymorphism. To explore the Python data analysis platform, we will focus on IPython (Interactive Python) and Jupyter Notebook. IPython is an enhanced interactive Python terminal specifically designed for scientific computing and data analysis; Jupyter Notebook is a graphical interface that combines code, text, equations, and plots in a unified interactive environment. Students will learn to work with widely-used libraries, such as pandas for data analysis and statistics; NumPy for its practical multi-dimensional array object; and MatPlotLib for graphical plotting. We will use these libraries to load, explore and visualize real-world datasets. This course is about leading boundary-spanning coalitions. An old African proverb tells us that, "If you want to go fast, go alone. If you want to go far, go together." While this advice is especially relevant in our interconnected 21st-century world, we have learned that working together is not always easy to do well. “Collaboration at Scale: Leading Boundary-Spanning Coalitions” takes the study of collaboration into an even wider realm by examining the potential and complexity of large-scale, cross-organizational collaboration, and how to lead it. Students will learn the characteristics, conditions and dynamics of various large-scale collaborations, as well as how to design and lead them effectively. Course materials will be drawn from the for-profit and nonprofit worlds. Using a balance of practice and theory of networks and large system facilitation, students will demonstrate their mastery of course materials through an assignment in which they diagnose and (re)design a “collaboration at scale.” This could be in the business, scientific, religious, political, or humanitarian domains. This course explores key knowledge management and organizational learning concepts and techniques that are critical to business, individual, and organizational performance. As technology and the network economy drive businesses to compete under continuously accelerating rates of change in technology, business leaders must incorporate knowledge management and learning into their organization’s activities in ways that support and propel their business goals. They must also be proactive in recognizing and responding to the influence of technology on these goals and environment(s) in which they are accomplished. Class sessions encompass a set of topics including purpose, planning, success measurement, and implementation of knowledge management initiatives and organizational learning techniques. Through lectures and individual and collaborative work, students explore how they can use these techniques to improve business performance and strengthen their leadership and management capabilities. Exponential growth of information and data—combined with software that can understand and learn from analytic experience—provides entrepreneurs with tremendous opportunities to bring innovative customer-focused solutions to market. While there are no direct paths to bring a new product idea to market, there are easily identifiable milestones that can guide the way from idea generation to product profitability. This course will explore the process of early stage development of knowledge-driven, data intensive digital products like Pandora, Netflix, Watson and Trip Advisor. The goal is to create an entrepreneurial experience at its most elemental and visceral level—ideation, brainstorming, interacting with customers, building a founding team, developing a business model, managing risk, investigating competitors, and pitching the business to potential investors. Students will be exposed to all the pressures and demands of real world start-ups by participating on teams tasked with creating deliverables required to launch a new business. In this hands-on class, students will learn the theoretical and practical fundamentals of research-based digital product design through the creation of an interactive mobile app prototype and a process case study. This class will focus specifically on ideating, researching, defining, designing and testing a mobile app idea of your choice through an iterative user-centered design process. Outside of this course, these same methods can be applied to creating any type of product, not just mobile apps. The user experience skills and methods that are taught in this class are in demand by employers and startups across nearly every industry, and reflect the latest best practices used to create today’s most widely used and award-winning digital products. Understanding of Python may be helpful but is not required. In recent years, machine learning techniques have made significant impact in a wide range of application areas in various industries. This course provides an introduction to machine learning concepts and algorithms, as well as the application areas. Topics will include supervised and unsupervised learning, learning theory etc. “We have more data than we know what to do with!” is a common refrain being heard more and more within the enterprise. How can companies take all that data and liberate it, so that anyone in the enterprise can leverage it to do amazing things? You will take a deep dive into the research, design and prototyping of analytic applications – programs that empower non-technical people to take advantage of the huge reserves of data in the modern enterprise. Within the class you will learn how to make three kinds of analytical applications: Exploratory Apps that allow users to make sense of trillions of rows of data, Task-Specific Apps that help people make informed decisions, and Monitoring Apps that can track live streaming data as it comes in through the internet of things. This course is designed for students who are confident in programming with R.
Anomaly detection helps in the early detection of critical outliers in a system. Based on the context, these outliers can be detrimental and result in loss of resources, and time through errors, fraud, manipulation of stocks, and other such malicious activities. Outliers can also be beneficial for example in investing, and arbitrage. Business decisions that leverage anomaly detection, which used to require intense human resource and capacity can now be completed in a short time through versatile models and automation. In this course, students will learn how to find these unusual occurrences in the data. Students will be provided hands-on experience in multiple contexts with complex datasets that they must further manipulate through industry-specific data engineering. This course will enable students to build advanced supervised and unsupervised machine learning models to find these anomalies. Data engineering in this course will challenge students to engage in techniques of data manipulations with datasets that are NOT perfect. Data is a representation of “real things” within organizations (i.e. customers, business obligations, supply chain participants, purchase behavior). It is the primary factor of input into regulatory reporting, business analytics, product innovation and process automation. But the challenges of properly managing data are significant. There are many legacy repositories and business functions to unravel. There are social and political barriers to overcome. Data ownership and accountability are hard to implement. And many organizations are challenged to stay the course in the face of operational disruption and conflicting stakeholder requirements. This course will expose you to the data principles, governance processes and organizational prerequisites needed to manage data as a strategic asset – so that it can be leveraged and used with confidence. This course is a foundation course for learning software programming using the Java language. The course will introduce the student to programming concepts, programming techniques, and other software development fundamentals. Students will learn the concepts of Object Oriented programming using Java. The course will present an extensive coverage of the Java programming language including how to write, compile and run Java applications. The purpose of this course is to learn programming concept and Object Oriented fundamentals using Java. Students will receive a solid understanding of the Java language syntax and semantics including Java program structure, data types, program control flow, defining classes and instantiating objects, information hiding and encapsulations, inheritance, exception handling, input/output data streams, memory management, Applets and Swing window components. How do businesses and their employees navigate the rules and regulations that govern their operation? No matter what the industry, understanding the legal landscape is essential in today’s business environment. This course introduces the fundamental laws and principles governing businesses in the U.S. today. The effect of recent developments in case law and legislation on these topics will be discussed and debated in class. At the end of the course, students will have a solid understanding of the role the law plays in doing business across industries. How are ideas, products, and innovations protected? Every industry must ask these questions and understanding how the law works to answer them is an invaluable tool in today’s marketplace.This course introduces the fundamental principles of U.S. intellectual property law. The course will explore the basic concepts of copyright law including the requirements for copyright protection and the types of works protected, what rights and limitations come with copyright protection, and how the law is enforced. The course will also cover the main tenets of trademark law, including discussion of the Lanham Act, dilution, and unfair competition. Recent developments and controversies, including intellectual property protection for new technologies and the difficulty of enforcing protections on the Internet will also be discussed. Negotiation is one of the most important strategies in conflict resolution and is used routinely by all humans to resolve conflict and potential conflict successfully. This course examines both theoretical and practical implications of diverse assumptions and strategies. Students develop a deeper self-awareness of their role in the creation, perpetuation, escalation and resolution of conflicts, as well as in relationship with the other party. NECR PS4124. Intrapersonal Dynamics and Conflict. 3 pts. When we understand our cognitive, personality, temperament, motivational, learning, and communication styles, we can blend and capitalize on our strengths and manage our weaknesses. This course reviews the body of work that studies essential influences and the dimension of the intrapersonal dynamics that contribute to who we are and how we work. The course emphasizes a systems approach to understanding self and will be highly interactive, incorporating the participants' personal experiences and self-assessments (MBTI, The Bar-On Emotional Quotient Index, Communication Skills Assessment, Learning Styles Inventory). The course will be a blend of concepts and skills, theory and practical application. You will have opportunities to practice developing your skills throughout the course, and develop and implement an individualized plan for guiding strengths and managing weaknesses. The course will focus on sustainability indicators, the process through which they were developed, and how they are used to shape policy and track progress. This course will examine the science and history of our current environmental crisis with a focus on the various policy initiatives and actions being taken globally and locally including the specific efforts of the C40 Cities (40 largest cities) to both mitigate greenhouse gas emissions and prepare for the impacts of climate change. The class will look at case studies from different cities around the world as well as New York City's efforts through PlaNYC while introducing the principles underlying sustainability indicators-including greenhouse gas inventory protocols-and how they are used to influence and shape policies and decisions, and will offer students hands-on experience with these tools. The goal of this is to make students acquainted with the debate, challenges, and opportunities of a changing climate. The course will focus on the solutions and responses to the climate change challenges facing cities using real world and current examples. The course will survey a broad range of responses to climate change from international frameworks and global treaties to specific actions at the local level. Students will be required to critically evaluate what they have read and heard. In addition, the course will give students an opportunity to learn how to express their ideas verbally and in written form and conduct critical analysis of environmental data to develop and implement public policy. Assignments will give students the opportunity to use their technical and analytical skills while understanding the real world applications that will be important to their future professional work as planners, policymakers, advocates, architects, designers, and/or environmentalists. This course satisfies the M.S. in Sustainability Management's quantitative analysis requirement. The course introduces practitioners of environmental science and sustainability management to the data analysis techniques and statistical methods which are indispensable to their work. The class teaches how to build statistical substantiation and to critically evaluate it in the context of environmental problems. The statistics topics and examples have been chosen for their special relevance to environmental problems, including applications in environmental monitoring, impact assessment, environmental valuation techniques and econometric analyses of sustainable development. Students are assumed to have had no previous exposure to statistics. This course is a workshop in ERISA and Taxation Rules for Actuaries. Actuarial science can be applied and cover a number of welfare benefit arrangements (such as life insurance, medical, disability, severance etc. ), qualified plans and nonqualified deferred compensation plans. The services and products that are developed in the actuarial field may be governed by certain federal laws. In the U.S., these arrangements are governed by the Employee Retirement Income Security Act ("ERISA"). In addition, certain federal taxation and reporting rules may apply. To be successful in the field will require an understanding of these rules, reporting requirements, taxation rules and the government agencies (Internal Revenue Service, Department of Labor and Pension Benefit Guarantee Corporation) responsible for oversight of such arrangements. Other topics covered will include SEPs, Simple Plans, 403(b) plans, 457 plans and Nonqualified Deferred Compensation Plans. This course will provide an overview of insurance company investments and the regulations and liabilities that drive the insurance company investment decisions. All life insurance actuaries must master the concepts of financial mathematics and how to apply those concepts to calculate projected present values and accumulated cash flows. You will study these concepts and apply them to calculate Life Insurance and Annuity reserves, new business pricing, and profitability metrics. This will include exploring various types of product designs. Actuaries play an important part in development and interpretation of the various financial statements that insurance companies are required to provide to the public. The course will illustrate the content of these statements, exhibits, and schedules and provide a description of their purpose. Insurance cash flows are unique in that there are many uncertainties and those cash flows stretch out into the future over a considerable amount of time. This leads to another important aspect of actuarial science, which is risk analysis and risk management. This course will study how companies map risks and set aside capital to provide for the uncertainties above and beyond those provided for by standard reserves. With the recent economic events of 2008 and their continuing effects, Enterprise Risk Management (ERM) has become more focused and we will explore ERM and the role actuaries play as part of overall insurance company risk management. ACTU PS5630. Property and Casualty. 3 pts. This course introduces the general principles of ratemaking and reserving as they relate to P&C insurance products. Students will analyze data, select appropriate techniques, and develop solutions to problems. This course addresses the advantages and disadvantages of the various ratemaking and reserving techniques as they are applied to specific situations and different lines of business. Classification of insureds for the purpose of risk stratification and other important ratemaking topics are also examined. ACTU PS5621. Investment & ALM for Actuaries. 3 pts. This course develops an understanding of the fundamental concepts of Investment and Asset Liability Management (ALM) for actuaries. A basic knowledge of financial mathematics is assumed. This course provides students with the knowledge to apply in a practical sense the theoretical framework that they learned from the foundational actuarial examinations. The objective of this course is to provide students with an overview of the tools and techniques mostly used by insurance companies and to a lesser extent by other financial intermediaries (such as pension plans or foundations and endowments) for Asset Liability Management. The course will be aimed at providing a practical insight into the investment process within the insurance industry and other financial intermediaries. The role of databases in data analytics cannot be overstated; databases facilitate efficient, secure and accurate information storage and retrieval across multiple users and platforms. As a result, proficiency in database design and knowledge of SQL programming are essential skills for the modern analyst and data scientist. This course is designed to help students develop these skills. Data hardly ever comes ready to be analyzed. In fact, in many analytics projects, –the preparation of data (be it collecting, loading, organizing, filtering, etc.) can take more than 80% of the team’s time and resources, often forcing them to rush through the analyses in order to produce results. This course will demonstrate how relational database design coupled with efficient programming can alleviate the burden of handling messy data, allowing analysts and data scientists to focus on delivering accurate, reliable and reproducible results. While the Structured Query Language (SQL) has not changed much in the past decade, database systems and the tools that interact with them have continued to evolve. Students will be introduced to the latest programs and database connectors that allow for tight integration with Python and R as well as interactive visualization in Power BI and Tableau. Additionally, students will be exposed to NoSQL database systems optimized for big data analytics and the techniques necessary for interacting with massive amounts of data. This course features a final project in which students will leverage their newfound skills to tackle real-life data management scenarios by designing appropriate database schemas and demonstrating how raw data can be transformed into actionable insights.